No dish is more symbolic of Kuwaiti hospitality than Lamb Machboos, which is traditionally prepared by Bedouins with a freshly slaughtered sheep to feast a visitor. Today, mutton retains its popularity and is widely available in supermarkets and butcher shops. Contrary to Western methods of cooking meat, this dish is prepared by first simmering the meat in water, then browning it in oil and spices. The stock is used to prepare the rice, and a flavorful garnish ( heshew ) and tomato sauce ( dakkous ) are served over the top before eating. Chicken machboos can be prepared in essentially the same manner, but of course cooking time is reduced. Wash a leg of lamb or large lamb pieces thoroughly and place in a pot. Cover with water and spices, and simmer one hour or more till the meat is tender. Add salt after half an hour. When meat is tender, remove the meat, and strain and reserve the stock. While the meat is cooking, rinse the rice, leave to soak in cold water for 15 minutes, then drain well. Also prepare the heshew and dakkous . In a separate pan, heat 1/4 cup oil. Sprinkle meat with a teaspoon of ground cardamom, brown it in the oil and remove. To the remaining oil add the drained rice and 4 cups of stock. Bring to a boil, reduce heat, and simmer till all the liquid is absorbed. Pour saffron water over rice and top with meat. Cover well and warm on lowest heat for 15 minutes. 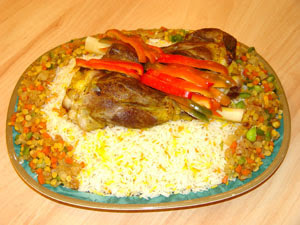 Spoon rice onto a shallow dish, top with heshew and meat. Serve with dakkous . Serves 4-6. Brown onions in a non stick pan without oil, stirring continuously. Add pine nuts and brown, then add drained sultanas and spices. Set aside. Fry onions and garlic till golden. Add remaining ingredients, stir and simmer 5 minutes. Rinse chicken inside and out. Place in a stockpot with enough water to cover. Add cinnamon stick, cardamom pods, cloves, and peppercorns. Bring to a boil, and continue to boil uncovered over medium heat until chicken is done (approximately 40 minutes). Remove and drain the chicken, reserving broth. Drain fat off the top of the broth and strain broth to remove spices. Prepare three cups of basmati rice according to package directions, using broth from chicken instead of water. Add salt if necessary. While rice is cooking, cook onions in a nonstick skillet over medium heat, stirring frequently, until clear. Sprinkle with a little water and stir quickly until onions are brown and the water has evaporated. Stir in oil, drained raisins, and spices. Cook for one minute. Remove mixture from skillet and set aside. Lightly dust the boiled, drained chicken with flour. In a clean skillet over medium-high heat, brown the chicken, turning frequently, until the outside is brown and crispy. For the tomato sauce, add water, chopped tomatoes, crushed garlic, and tomato paste in a small skillet or saucepan, and sauté until tomatoes are soft and the sauce well blended. When the rice is done, spread it on a serving platter. Sprinkle the onion-spice mixture over the rice, and place the chicken on top. Pass the tomato sauce to spoon onto individual plates. *Chickens in Kuwait are much smaller than in the United States; two Cornish hens can be substituted for the fryer for a more “authentic” appearance. *** Many Kuwaiti dishes call for loomi, which is dried and blackened lime, generally unavailable in the United States. Its flavor is strong and unique. Grated lime peel is suggested as a substitute for loomi in this recipe, but the taste will only approximate that of Mechbous made with loomi. Tried your machboos recipe and it was really good. The whole house smelt awesome! сan i do it ρlease hеlp out. that much available money. But it would be financial suicide to put 100%of your investments in penny stocks, a bit may be fun but go in with your eyes wide open. Gourmetshelf.com gives best and incredible quality in sustenance industry and we give best new guarantee for our things. Choices are advancing Food online Kuwait, gourmet store in Kuwait, Italian Gourmet items in Kuwait and Spanish gourmet in Kuwait or Vanilla glue Taylor in Kuwait.